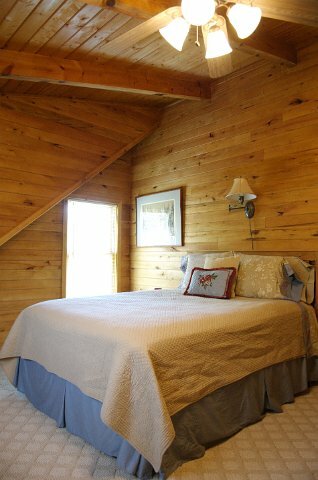 The Chestnut includes three bedrooms with a king bed and a private bath on the main floor and a queen, double and queen futon on the second floor with a full bath. 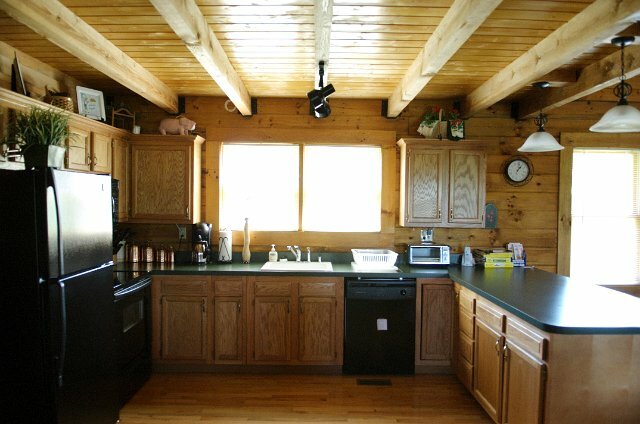 It also includes a half bath in the laundry room on the main floor. 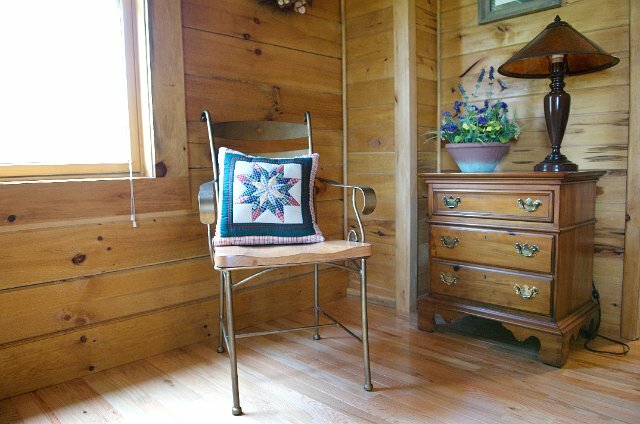 There are great views in the chestnut cabin and you can enjoy two porches with tables and chairs on each. You can barbeque outside with our charcoal grill and hike on our mowed paths. Find us on VRBO #324265 and check out our 5 star reviews! You can book us on americanrentals.com and pay no fees! All Holiday reservations are priced as Summer High Season. If you have only 2 guests and desire to stay on a peak or shoulder weekend. Peak Season Weekdays are $240 + $30 per extra person up to 8. VRBO site does not accommodate this pricing model. The $420 is a default. However, if you have 8 guests the rate would be $420. 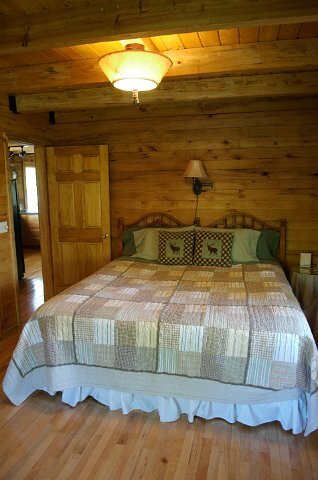 Weekend rates are $420 for up to 8 guests. 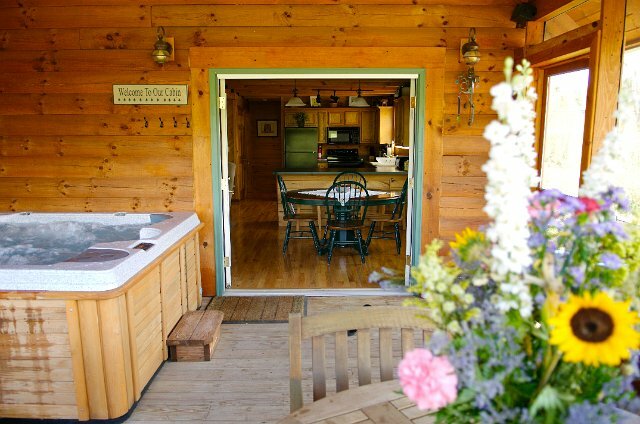 Spring and Fall Shoulder Season Weekend rate is $420 for up to 8 guests. Weekdays are $240 + $30 per extra person over 4 up to 8. 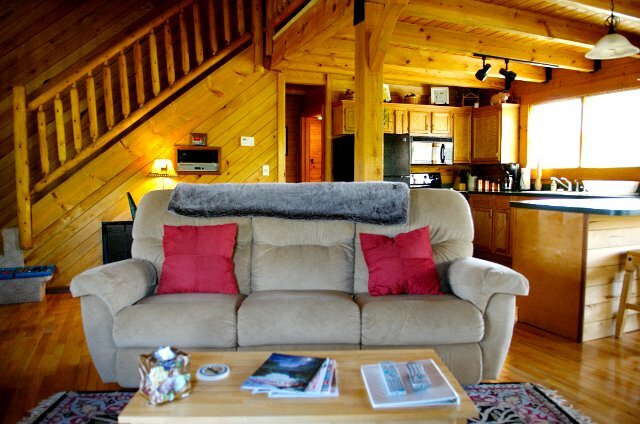 Off Season Weekend rate is $240 for up to 2 guests + $30 per extra person up to 8. Weekdays are $240 for up to 2 guests + $30 per extra person up to 8. 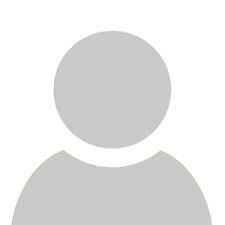 Cancellation Policy-50% of deposit up to 3 weeks in advance. Within 3 weeks, 100% of deposit. Cancellation Fees may be used for future stays upon management's discretion. 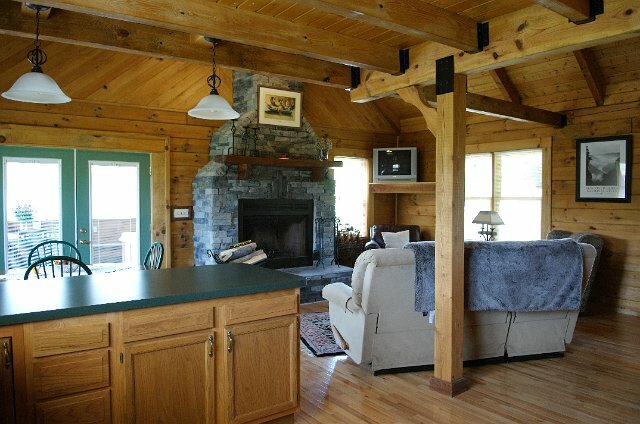 Great cabin, great location, great vacation! 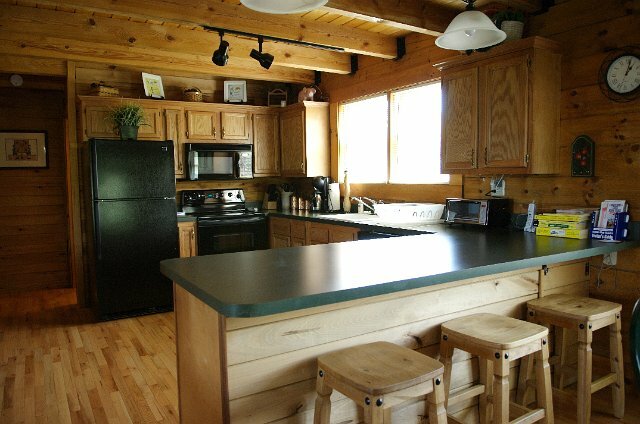 Wonderful cabin ideally located a short drive away from Fayetteville, hiking, and whitewater rafting! 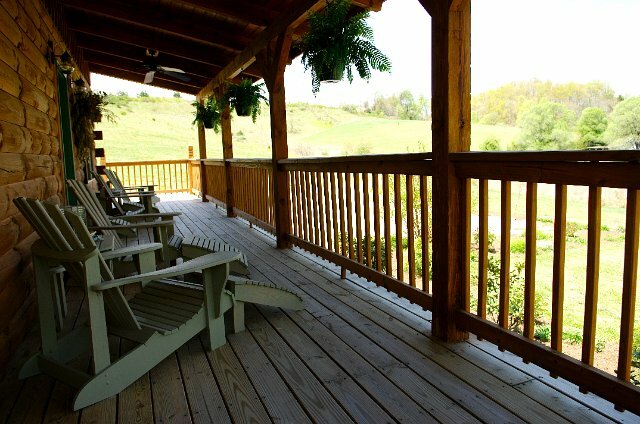 Well maintained retreat with a lovely screened porch with hot tub for enjoying the outdoor air minus (most of) the bugs, central air for cooling off on hot days, TV & wifi for watching or catching up on football games on the weekends, great firepit & charcoal grill outdoors, and comfortable beds! Helped make our trip to West Virginia a wonderful vacation! Beautiful home and great hostess!!! So conveniently located to all the nearby adventures!!! We booked this home for our family vacation and could not have been more impressed!! The house was even better than we expected and had everything we needed. Such a beautiful property and so conveniently located!! We thoroughly enjoyed our stay!!! Cabin was very nice and stocked with everything we could have needed. The hot tub was fantastic after white water rafting all day. Brenda was very friendly but did not impose at all. The six of us had a fantastic weekend. Thank you so much! We were fortunate to find such a lovely place to land each evening after the Jamboree. It was quiet, roomy, clean and well equipped. The surroundings were beautiful and had we not been exhausted from working with over 500 Boy Scouts in a Makerspace each day we would have loved to explore the trails. Fantastic stay at The Chestnut! Our family stayed here for 3 nights and loved it. Between the nicely decorated and fully stocked cabin, the lovely front porch, the hot tub, the piped in XM music, the fire pit, the grass area in front of the cabin to play games, the privacy and seclusion despite being close to the highway and all Gorge activities, as well as the 60 acres of beautiful land on the property to explore (wild meadows, abundant wildlife), we were all very impressed and fully enjoyed our stay at The Chestnut. Brenda was very welcoming and available if needed. We look forward to our next visit! Thank you so much for an enjoyable get-away for our family.